Old Car Memories > Commentary > Pontiac – Goodbye Old Friend! What’s the Deal with the 3-speed Manual Transmission? Pontiac – Goodbye Old Friend! When I was a youngster Pontiac was GM’s performance division. It was hip and youthful. Owning a Pontiac meant you weren’t some regular Joe – you were a performance-oriented driver. Even the big Pontiac sedans and station wagons had a performance aura about them. And this was the 1970s mind you, a time when most automakers had abandoned performance. The Trans Am was the performance king then and the Corvette was an overpriced powder-puff. Pontiac since its inception in 1926 had always had a loyal following. However by the 1950s that crowd had become the older frugal buying public. The youth then had as much interest in Pontiac as the youth today have in listening to Frank Sinatra. However a few key people at Pontiac led by Pontiac General Manager Semon “Bunkie” Knudsen wanted to change things. By the late 1950s Pontiac introduced its wide-track lineup. Bunkie had hit a home run and the youth were soon taking notice. Helping to cultivate the new youthful image was a powerful lineup of V8 motors. Pontiac had first introduced its V8 in 1955. By the late 1950s displacement was up to 389 CID. The Bonneville, Pontiac’s top-of-the-line full-size car was for its day the perfect balance of performance, comfort, and handling by 1959. By the early 1960s Pontiac was winning big on the different racing circuits. Its 421 CID Super Duty powered cars were gaining a street and track reputation that still is revered almost 50 years later. Pontiac was soon forced to back off its support of racing, by a GM decree. By this time John Delorean now Pontiac General Manager was bringing Pontiac to the next level. Delorean’s bold move was to defy upper GM management and release a high-performance large displacement mid-sized muscle car for the 1964 model year called the GTO. Not only was this move a great sales success but also it started the muscle car phenomenon. Within a few years just about every American automobile brand had a GTO competitor. The 1960s were the glory days of Pontiac. The Grand Prix a 2-door sporty performance luxury coupe introduced in 1962 would be a segment leader for many years. The 1964-1967 Pontiac Catalina 2+2, a sporty 2-door was a “world class” big high-performance car. The Firebird would be introduced in 1967, and it would remain a key leader in its segment for 35 years. Spawning from the Firebird was a top-of-the-line model called the Trans Am first introduced in 1969 as a low volume model (697 total were produced). By 1979, Pontiac sold an astounding 116,535 Trans Ams for that single model year. Pontiac could also be counted on in the 1960s to have sporty interior and exterior styling – far ahead of its competition. These were the days when all Pontiacs shared a common look and could not be confused with any other auto brand. So it came as no surprise that Pontiac was a sales leader during this time. When the 1970s rolled in, the times had changed; new Government regulations, high insurance costs, and two fuel crises crimpled the American automakers. Pontiac weathered the 1970s the best it could still trying to deliver performance in sporty packages. Its performance leader the Trans Am, had skyrocketing sales in the 1970s with each year hitting new highs. When all the automakers abandoned performance, Pontiac still tried to deliver. Sales were still good, and Pontiac remained GM’s performance division. Pontiac was still stuffing its large displacement 455 CID V8 under the hood of the Trans Am and other Pontiacs through the 1976 model year. These were the days when the best the Corvette and Camaro had was a small-block 350 CID V8. GM unfortunately made Pontiac pull the plug on the 455 at the end of the 1976 model year. Pontiac then beefed up its 400 CID V8 with a W72 package giving its Trans Am the best performance of any American car in the late 1970s. GM would soon force Pontiac to retire the 400. Its last stand was the W72 400 in the 1979 Trans Am and Firebird Formula. To be fair it was not really GM’s fault, for GM was looking down the gun barrel of the EPA’s C.A.F.E. (Corporate Average Fuel Economy) standards, and the only way to meet these very stringent standards was displacement shrinkage. Pontiac refused to say “uncle” and soldiered on with a turbo version of its 301 CID V8 for 1980. Though it paled in comparison to the W72 400 it replaced, it still provided enough punch to keep the Trans Am a solid performance car. Unfortunately the Pontiac magic would soon come to an end. The 301 was mandated by GM to end production by the close of the 1981 model year. GM had decided for the 1982 model year to enact a new corporate engines policy that had each GM division producing engines to be used by other GM divisions. GM by the mid 1970s started experimenting with engine swapping among its divisions. On paper it seemed to be a winner by saving production costs however it created a swarm of angry customers and some lawsuits by those who bought cars from one GM division but ended up with another division’s engine in their cars. For 1982 only Chevrolet, Oldsmobile, and Cadillac were allowed to make V8 motors for GM’s divisions (Cadillac was somehow exempt from sharing the V8s it produced which were only used in Cadillacs during the 1980s). Pontiac was stuck producing the 2.5 liter four cylinder Iron Duke for the different GM divisions. This was horrifying news for Pontiac buyers, for the first time ever; there would be no Pontiac cars powered by Pontiac V8s. The Trans Am in the 1970s competed with the Corvette and beat it hands down in all performance catagories by the late 1970s. Even in the late 1970s the Camaro Z28 was no competition for the Trans Am. By 1982 the Trans Am was forced to use the same engines as the 1982 Camaro Z28 which were a choice of two small-block 305 CID V8s both of which had substantially less horsepower than the previous year Pontiac made turbo 301. The Corvette retained a small-block 350 CID V8 as its power source. This ensured for the remainder of the Trans Am’s life, it would always place second to the Corvette (except in 1989, the 20th anniversary turbo Trans Am easily beat the 1989 Corvette) in every performance category and would be from that day forward a Pontiac with Camaro engines and drivetrains. Pontiac made the best of its predicament. Even with its V8 engines long gone and GM’s push to new front-wheel drive architecture and cookie cutter designs, Pontiac still managed to make performance its central theme. During the 1980s exterior styling was still innovative and ahead of its competition. The Pontiac ad slogans declared Pontiac as the “we build excitement division”. Many buyers agreed and sales were good. Such performance oriented front-wheel drive cars as the Pontiac 6000 STE and Grand Am were winning accolades by the auto press and helping Pontiac remain GM’s performance division during the 1980s. One great light of hope was the introduction of the sporty 2-seater Pontiac Fiero for the 1984 model year. John Delorean had tried unsuccessful to get the approval for a 2-seater Pontiac sports car back in the mid 1960s. GM was afraid it would cut into Corvette sales. Twenty years later GM would allow Pontiac to have its 2-seater sports car, however Pontiac had to market it as an inexpensive four-cylinder commuter car (powered by Pontiac’s 92 horsepower 2.5 liter Iron Duke) thereby ensuring it would not cut into Corvette sales. Pontiac by the next year added a more powerful 140 horsepower 2.8 liter MPI V6 to the Fiero option list, and it seemed the Fiero was on its way to being a respectable performance car. Sales were good those first few years. By 1988 plagued by the bad publicity of a recall and increased competition in the 2-seater market, sales had dipped considerably. Pontiac decided to pull the plug right before a new more powerful Fiero was to be introduced. It was a sad day especially when the V6 powered 1988 Fiero GT and Formula were the best Fieros by far. Both had Lotus tuned suspensions giving them the handling and performance of sports cars more than double their price tags. As Pontiac rolled into the 1990s, styling started to suffer. No longer was styling appealing. Styling was still modern yet the lines had become wild and erratic. There seemed to be no flow to the new designs. It was as if the cars had taken too many steroids and their proportions looked ridiculous. The elegant styling of the 1982-1992 Firebird/Trans Am was replaced in 1993 by a new Firebird/Trans Am that had what Motor Trend magazine called “Boy Racer” styling – something they weren’t so sure was going to age well. Unfortunately Motor Trend’s prediction has so far been true. By the 1990s it was becoming quite clear that Pontiac was no longer setting the trends in the performance market it was now following them. In the late 1980s and early 1990s Pontiac had let the formerly successful 6000 STE and SE die a slow agonizing death. It had been slowly replaced with the Grand Prix, which by then was also available in a 4-door model and was getting wilder styling each model update. The Grand Am also had wild styling during the 1990s, and had the popular body clad siding the entire side length of the car. Both of these cars fortunately sold well for Pontiac. It was during this time that the Firebird/Trans Am was going into a serious sales slide even as horsepower was increasing. The wild styling and lack of action to remedy the problem led to the problem getting worse until GM finally pulled the plug on the Firebird/Trans Am and Camaro at the end of the 2002 model year. By 2003 Pontiac had lost its flagship performance car, and was as far from being GM’s excitement division as it could possibly be. Pontiac dealer lots were soon filled with boring and uninspiring cars and even ugly Pontiac SUVs. GM Vice Chairman Bob Lutz, attempted to breath a little life into the former performance division with the Australian built 2004-2006 GTO (350 horsepower for 2004 and 400 horsepower for 2005-2006). Though performance was plentiful (in fact it was better than the mighty GTOs of yesteryear), its styling was closer to a Honda Civic than a modern muscle car. Buyers stayed away and GM was forced to cancel it. 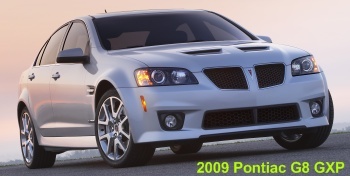 GM tried again within the last year to breathe life into the division by introducing the Australian built Pontiac G8 sedan (which in GT trim has 361 horsepower and in GXP trim a whopping 415 horsepower). The G8 is the 4-door sedan Pontiac buyers have been waiting for the last twenty years. Its styling is muscular yet elegant. It has all the excitement that Pontiac was once known for delivering. The car is comfortable and handles like it’s on rails. The only bad thing about the G8 is it came too late. Too bad it did not arrive ten years ago, even five years ago could have made a difference. On April 27, 2009 – GM announced the news Pontiac fans have been fearing the last few years – the death of its performance division. It was not unexpected. Pontiac has been limping along as a shell of its former self for many years. Even a great car like the G8 could not save the terminally ill division, which GM left for dead while spending its development dollars on popular high profit SUVs. More than likely GMC, Hummer, and Saturn will follow Pontiac to the auto graveyard. Buick even though its sales are strong in China, may also be going there soon. However none of these divisions have the rich history that Pontiac has. There was a time when Pontiac was the envy of every automaker and its cars set trends. For the many that remember or own these glorious Pontiacs of that golden era, they know this is when GM let Pontiac be Pontiac, and it was before the Government killed the Pontiac V8 engines that made the Pontiac division a legend.